Moving is a dull and dreary task. It entails hard work, time and money to pull out a successful move. Though many consider a DIY move, but it adds to stress and anxiety. In fact invariably not everyone possesses the skill and temperament to handle a move which leads to loss and damage to belongings and mounted frustration levels. But with reliable and reputed professional removalists taking up the job, the job is much easier and hassle-free. 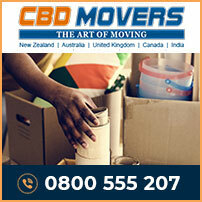 At CBD Movers NZ, we offer the finest removal services in Auckland. Well trained staff, extensive list of removal services, and best removal gear with the finest fleet of trucks; we have everything for an effective and successful relocation. At CBD Movers NZ, we offer the widest array of removal services. From assisting residential clients to move home set-ups to helping business owners relocate offices, we are equipped to handle all. Our crew excels in dismantling and reassembling furniture pieces and therefore is reckoned as reputed furniture movers in Totara Heights. Besides comprehensive packing and moving, we also provide services for basic loading and unloading. With us you are sure to move in the most competent manner. Apt removal gear is important for carrying out the removal effectively. We possess the latest tools and techniques and own a fleet of trucks that is outfitted with climate control system for protection to belongings from temperature variations. Our men are trained to use the equipment in the most proficient manner. The licenses and permits allow us to undertake both local and interstate moves. We leave no stone unturned and promise to register a happy and hassle-free move every time. 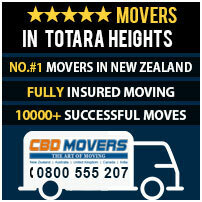 At CBD Movers NZ, we take pride in our superior removal services and the most competitive and affordable rates. As every removal is different, we offer tailor made services that fit both requirements and budget perfectly. The comprehensive transit insurance further adds to the safety of the move. Our dealings and operations are transparent and we have no hidden extras. Totara Heights is a suburb in the Auckland region of New Zealand. Strategically situated between Goodwood Heights, Wiri and The Gardens, it is a perfect place to live and work. At CBD Movers NZ, we extend our able services and customized support to help people move to and from Totara Heights easily and competently. Our services are safe, reliable and affordable. Get in touch with us for customized deals and removal plans.